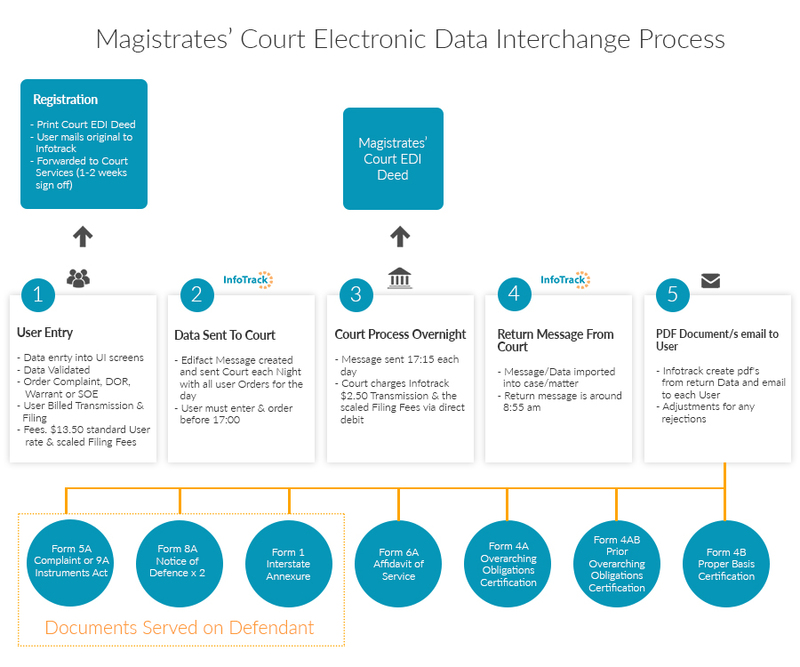 Electronic Data Interchange (EDI) for use in the Court system has been available in Victoria since the 90's. EDI removes the laborious task of printing documents, preparing cheques or duty stamps purchased and forms which need to be physically filed at the Court Civil Registry. It is anticipated that this technology will be expanded to cater for other Court documents and jurisdictions in the future. Eliminate the need to prepare, receipt and reconcile cheques. Documents can be issued for any Magistrate’s Court in the State using one process. Faster turnaround time ensuring a better client experience. Rules regarding required information are better defined and more consistent to minimise rejections. Postage costs and staffing levels are reduced. No upfront costs with filing and transmission fees on accounts. The complaint issue process is entirely paperless. User-friendly, easily operated data entry screens. Multiple attachments and annexures to base documents. Attach .pdf documents with the Complaint.